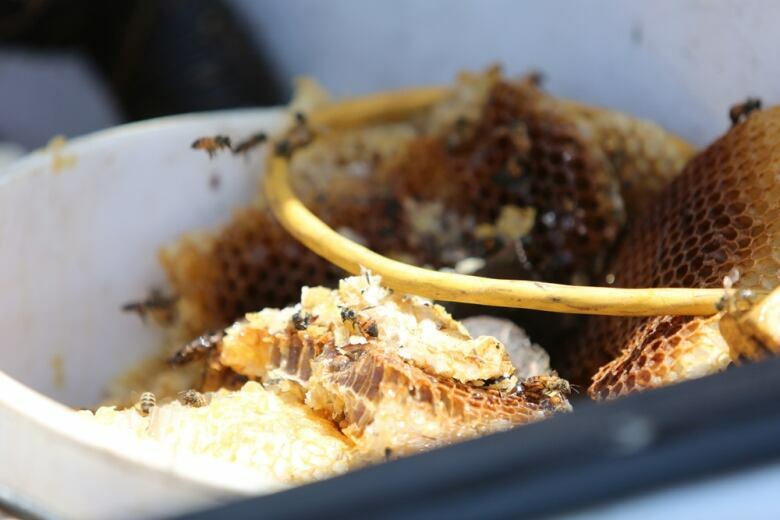 A housekeeper was grabbing cleaning equipment from a car in Lake Forest, Calif., when she was set upon by more than 30,000 Africanized honey bees. 'We realized this is life or death for her. She was paralyzed,' says Orange County firefighter. 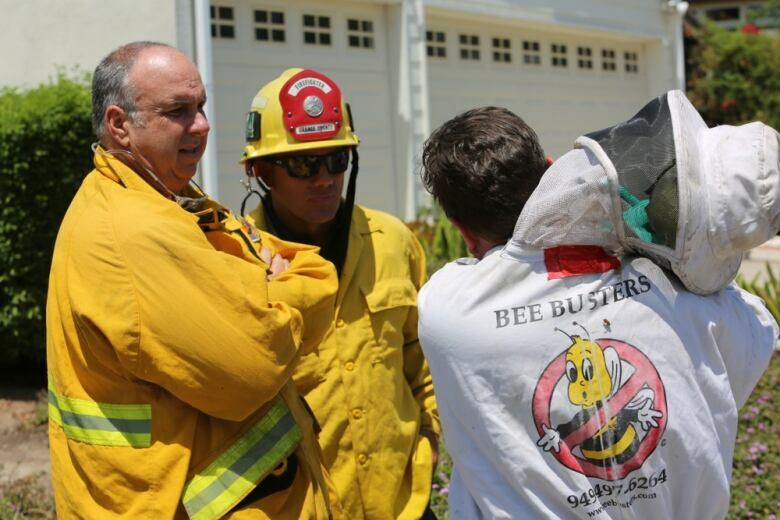 When firefighter Ryan Wilson responded to an emergency call at a Southern California home on Monday, he said the air was "just full of bees." "It was almost like a cloud, like a haze in the sky," Wilson toldAs It Happens guest host Laura Lynch. "It was almost like a tornado, like bees in a big plume, kind of circling a neighbourhood block." That's when he saw her — a woman frozen in fear at the centre of a giant swarm of bees. The woman was working as a house cleaner and had just stepped out to grab some cleaning equipment from a car when she was set upon by tens of thousands of Africanized honey bees, also known as "killer" bees. "We realized this is life or death for her. She was paralyzed," Wilson said. "She was standing there with her arms out in front of her, perfectly still, and she was just covered in them. The only thing that was moving was her eyes and she was speechless." The firefighters weren't wearing any protective gear because they thought they were responding to a run-of-the-mill bee sting. They didn't want to waste time getting gear, so they made their way toward the woman. "It wasn't till I got about, I'd say, 20 feet from her when I realized the colony was attempting to colonize into her hair and around her shoulders and face," Wilson said. Every part of her body that was exposed — arms, necks, shoulders, head — were covered in bees. "The bees appeared to be kind of clumping up in clusters," he said. "Her hair was full of bees. I couldn't tell you how many, but her hair almost looked alive." Wilson's colleague grabbed a carbon dioxide extinguisher and sprayed at the swarm, freezing bees in mid-air. "They were dropping out of the sky like rain," Wilson said. "You could just hear them all around the sidewalk and the street just falling as he was spraying just in big circles around the both of us and himself." The insects would thaw and spring back to life. The firefighters decided to grab the woman and make a run for it. The swarm, Wilson said, chased them for two blocks. "We were still getting stung," he said. "We could still hear them hitting us, almost like BBs out of a BB gun." The woman, who has been identified only as Maria, was hospitalized in critical condition with more than 200 stings. But her son has since told firefighters she is doing better and is expected to survive. Orange County fire Capt. Tony Bommarito said four firefighters were stung during the dramatic rescue, and two of them were treated at a hospital. All are expected to recover. Wilson said he got stung four or five times, but is doing fine. Bee experts later came in and removed about 4.5 kilograms of beehive from the bushes near the driveway of a house. They estimate the colony hive contained somewhere between 30,000 and 100,000 Africanized bees — an aggressive hybrid of African queens and European honey bees originally bred to boost honey production in Brazil. The dangerous insects have been spreading through South America and the southern United States since 1957, when 26 African queen bees and swarms of European worker bees escaped a Brazilian enclosure and formed a hybrid population, according to the Smithsonian. The museum estimates that about 1,000 people worldwide have died from Africanized honey bee attacks since they were first introduced to Brazil. Written by Sheena Goodyear with files from The Associated Press. Interview with Ryan Wilson produced by Katie Geleff.